The hoarding at this El Paso, Texas, home became so bad that Adult Protective Services had to intervene. (CNN) -- Rescue workers drilled a hole in the roof of a suburban Chicago home to extract an 82-year-old woman's body this month. They couldn't get through the doorway because her home was filled almost to the ceiling with cardboard boxes, furniture, clothing and other junk. She and her daughter had been crawling through tunnels to move around the Skokie, Illinois, house. They and others like them are hoarders, people who amass excessive numbers of possessions and don't discard them. In extreme cases, hoarders' obsession with junk has led to fires, attracted vermin, endangered their families, neighbors and themselves to the extent that experts describe it as a growing public health problem. Hoarding has become so frequent that a growing number of cities have formed task forces to bring housing, elderly services and health departments together to address the cases. The behavior has also captured the attention of cable networks with A&E's "Hoarders," TLC's "Hoarding: Buried Alive" and Animal Planet's "Confessions: Animal Hoarding." In the series, people sleep on beds covered in animal feces and hairs, traipse through narrow pathways in a labyrinth of garbage and alienate their loved ones. The shows spread awareness about the behavior, said Elizabeth Nelson, who has tried to intervene on behalf of her mother, who hoards magazines, newspapers, junk mail and various objects. "It's showing the general public how hard it is," said Nelson of Ann Arbor, Michigan. "Most of the people seem reasonable -- it's just that they had a breakdown and it's revealed just how difficult and irrational they are in dealing with stuff." But the problem is that many hoarders do not realize their behavior is troublesome. "Every situation you see on TV where someone is willing to let people in, there are million others who won't let outsiders in and the family has no access to help," she said. Finding effective mental health treatment is a challenge because researchers aren't yet sure what works best. Meanwhile, for reasons unknown, reports of hoarding have increased. Epidemiological studies suggest that hoarding occurs in 2 to 5 percent of the population. One of the most famous cases dates back to the Collyer brothers of New York City. In 1947, Langley Collyer was killed by one of the booby traps he had devised in his Harlem apartment to protect nearly 130 tons of junk. His older brother, Homer Collyer, who was blind and crippled by arthritis, starved to death in the apartment about 10 feet away, according to news reports. "The American fascination with it is that it's an exaggeration of a trait that many people share," said Dr. Kenneth Weiss, associate professor of psychiatry at the University of Pennsylvania School of Medicine. "A lot of people know people who are pack rats, who collect stuff and cannot get rid of it, and compulsive shoppers, who buy and accumulate things they do not need." For hoarders, the behavior spirals out of control in a self-destructive manner. 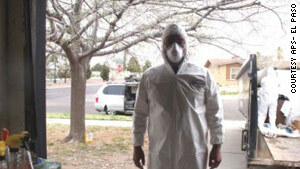 Felix Cabrera, an Adult Protective Services specialist, prepares to inspect a hoarder's house. In February, a woman died inside her El Paso, Texas, home in a fire. Newspapers strewn throughout her house fueled the flames, and firefighters weren't able to reach her because of the clutter, said Felix Cabrera, a resources and external relations specialist at the Adult Protective Services in El Paso. Months later, the local authorities formed a multi-agency hoarding task force. Cabrera called it a constant problem, with about eight open cases in El Paso alone. It affects the community by spreading pests and possible health dangers, Cabrera said. He referred to a case he assisted in May that had occurred nearby in Las Cruces, New Mexico. A woman called 911 after falling in her home and rescuers found her inside a house filled with nearly 300 rats. Residents living nearby reported seeing rodents scurry on the streets, and one neighbor told CNN affiliate KFOX that a giant rat was found in the motor of a stalled car. Hoarding also puts a strain on public agencies, because the people are often elderly on fixed incomes who cannot afford clean-ups, Cabrera said. Social services or other agencies have to clean the house, fumigate and provide foster or nursing facility care while the home is being restored. One recent clean-up cost $15,000 and required five dump trucks, Cabrera said. It becomes cyclical, because many hoarders refuse to get mental treatment. "They are competent and have capacity," he said. "You can't force them to get mental treatment. The community complains and says, 'What are you guys going to do?' Well they have capacity to make those decisions. The court can't force anything upon that." Hoarding is included as part of obsessive-compulsive personality disorder and obsessive-compulsive disorder in the current edition of the Diagnostic and Statistical Manual of Mental Disorders. This has been problematic because the many cases do not meet criteria for either disorder, according to experts. 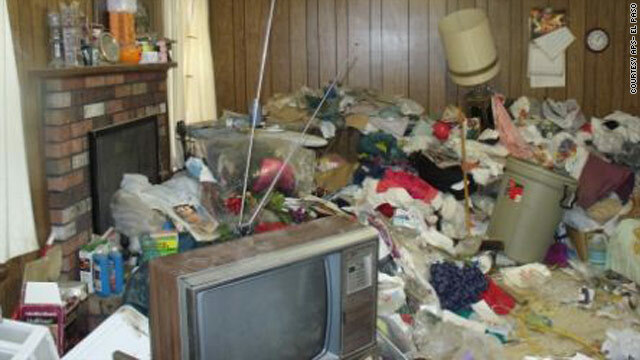 Psychiatrists are considering the inclusion of hoarding as its own disorder in the next edition of the mental health manual, with symptoms such as persistent difficulty discarding possessions, strong urges to save items, accumulation of a large number of possessions that fill up work and home, and impairment in social, occupational or other important areas of functioning. Not enough is known about the disease to determine whether it's an addiction or a compulsion, psychiatrists said. Theories why people hoard vary from a neurobiological basis that humans are hard-wired to collect, like squirrels, or that they are driven by trauma or fear of scarcity. They could be motivated by utilitarianism, too, said Dr. James L. Abelson, co-director of the Trauma, Stress and Anxiety Research Group at the University of Michigan in Ann Arbor. "People who collect papers, newspapers, bills, magazines believe there might be some piece of information that someday might be useful to have," he said. Hoarders often have been abused or have experienced psychological trauma, said Weiss, a forensic psychiatrist. They could be filling a void "with things that have memories attached to them. Hoarders attach excessive significance to things like garbage -- certain books or pictures. They can't throw out a magazine because 'it has a recipe my mother used to make.' They collect all newspapers, magazines, recipes, because they can't separate what's meaningful or not meaningful." "In some instances, people are afraid of breaking down because when they throw something out, it's like a piece of them is being lost, they can't deal with it," he said.